What a warm welcome the Amish Straight Back Windsor Bench provides! Paddle shaped spindles line the back and turned legs look elegant. The curved arms and rounded posts all contribute to the warmth. 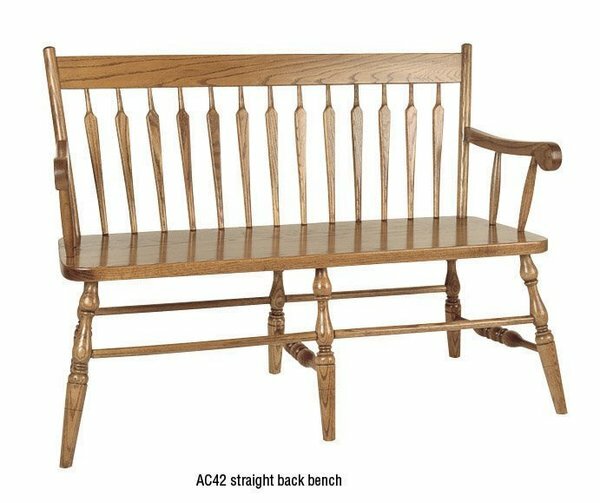 This bench is perfect for a foyer or hallway, or inside the bedroom or kitchen by the window. If you like the style of this bench and wish to tweak it you can! In addition to the wood and finish options, you can add arms or go armless. This bench can easily be made into a storage bench if you need one! Just have it built with a storage box. Our Furniture Specialists are happy to assist you. Email or call us today. Thank you for shopping DutchCrafters Windsor furniture. Height from Floor to Top of Back: 35"